When it comes to choosing curtains, there are so many options that it can be a bit overwhelming to decide which one will suit your space and needs best. And to make things even more confusing, there are so many terms that sellers and interior decorators use that make my head spin. Swag, jabot, inner lining, goblet pleat, fullness ratio, tieback… huh? That is why, before you buy curtain, I highly recommend you to get a cup of coffee and go through the basic terms. I hope that after reading this article, you will have a better understanding of what you like and whether or not it fits your needs. Curtains are generally lighter and less formal, like kitchen curtains or bathroom curtains. They also tend to be window length and are not lined. The curtains in this picture are called Cafe Curtains. They are a great example of how light, airy and informal a curtain should feel. Because they cover only a portion of the window, these are a great option if you want a simple window treatment that allows for a lot of light to enter, yet have the needed level of privacy. This is what drapes actually look like – a floor length window treatment that feels more formal. Drapes like these are often lined but they can also be inner lined. Made of heavier fabrics, these act as great insulators when the panels are closed. They can be either operative or stationary. The operative ones can open and close, while the stationary are decorative only and do not move. Also called jabot, this is a decorative piece of fabric that’s attached in a way that it hangs on a drooping curve. Multiple swags can be used to create a highly decorative top treatment. It can be made from any fabric and can be trimmed with lace, fringe or tassels. These are used when you want to hide the drapery hardware that makes the drape operable. Valances generally hang freely from a hidden rod or board, and can be flat, ruched, gathered or shaped. Very similar to the valence, the cornice is hard rather than soft. It is basically a fabric upholstered onto a padded board. Because it is not gathered or pleated, but tightly stretched, it is an economical way to use textile. When looking to buy curtain, you will notice that they are generally gathered or pleated in some way. There is also special vocabulary to describe the available choices. 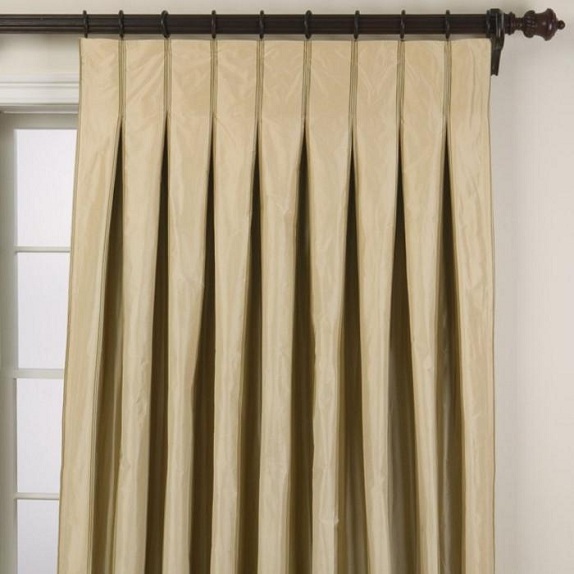 A curtain or drape that has a loop of fabric that attaches the panel to the rod. While it is a beautiful choice, it is not recommended if you want your draperies to go across the window. Another option used to attach a drapery panel to the rod. It is best recommended for stationary curtains rather than operable. There is also a great choice of pleat options, and these can be attached with rings to a rod, or with a hidden drapery rod. Instead of being gathered into fingers, this one is tucked at the bottom. In order to hold their shape, the goblets are usually filled with batting. This type of pleat forms a little box at the top. It is a good option if you are looking to create a more masculine vibe in a room. This accessory is mainly used to tie back the curtain or drapery. It has different functions, for example, it can hold back the curtain from the window to allow more light to enter in the room, or provide a way to open your window treatment when there is no traverse rod.